Vault Swiss redefine how time is displayed. The company’s unique, inaugural watch, the V1, features an innovative display. Indeed, the V1 timepiece, developed in collaboration with movement specialist Andreas Strehler, proclaims time differently each occasion the watch is set. Beyond its neoteric design, the V1 embraces traditional watchmaking craftsmanship and is imbued with flawless finishing. 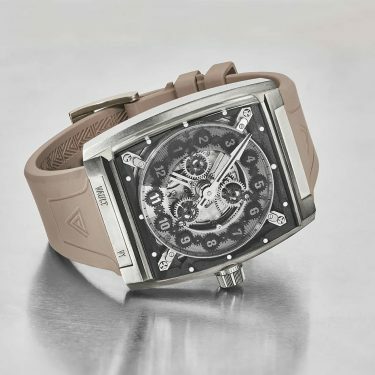 The mind-blowing design of the Vault V1 was penned by Laurent Auberson, working in collaboration with founders Mark Schwarz and Philippe Schmid.